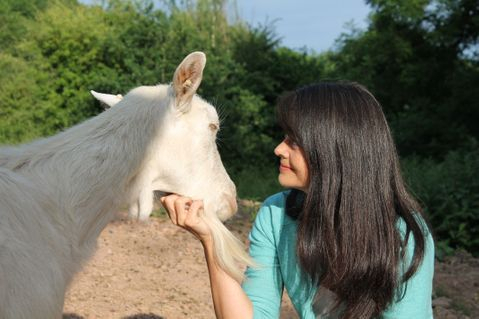 Susie Shiner is one of the UK’s most highly regarded animal communicators and has been practising the Art of Seership for almost 30 years as well as offering a druid healing practice. I am committed to being a voice for the animal kingdom, spreading awareness of animals as intelligent, sentient beings able to communicate their own wishes and point of view. My vision is to help heal the relationship between humans, animals and the natural world by raising awareness of the universal language by which all animals communicate with one another as well as helping people to deepen their relationship with the numinous presence of the divine in nature. She is both Druid, Seer, Animal Communicator, Medium and has been training people in the Art of Seership and Animal Communication for many years. Her druid healing practice offers both seership, healing & equine guided learning, helping people on their journey through life as well as guiding people to deepen their understanding of the mystery of their own natures. Originally a platform medium serving her local churches, Susie now demonstrates animal communication to amazed audiences. These demonstrations of animal communication have attracted much media attention and Susie has appeared on TV, Radio and in the national press, sending presenters and journalists “reeling” by providing them with personal evidence that they are truly talking to their animals. Susie is a graduate of Equine Guided Education, (CEGE), having trained with Ariana Strozzi, one of the USA’s pioneers of Equine Guided Education. She has more than twenty-five years experience in shamanic practice, a Certificate in Pastoral Care and Counselling, a degree in Politics and Social Policy from the University of Newcastle upon Tyne and a Diploma in Art and Design. Susie lives on the Devon/Dorset border with her family of humans & animals. By deepening people’s connection to the timeless wisdom of the natural world, and to our own beautiful shamanic traditions, I offer participants a safe and balanced way to develop their Sight. Through my teaching, workshops and healing practice, I help people to deepen their understanding of the mystery of their own natures and to access the well of wisdom and divinity that is within each one of us, enabling people to stand in their own authority, their own Sovereignty. I am passionate about developing people’s second senses so that they can have real experiences of the numinous presence within Nature; to hear the voice of Mother Earth; the Old Gods; the Ancestors; our Loved Ones Departed; to understand the hearts and minds of animals and to hold thought conversations with them. I have been training people in the Art of Seership and Animal Communication for many years, knowing that all of us have access to the universal language by which all beings communicate. This language is our birthright and gives us a deep sense of belonging to the vast community of other beings with whom we share our lives. I offer both seership, healing & equine facilitated learning in my healing practice, guiding people to deepen their understanding of the mystery of their own natures. Horses are my esteemed colleagues, who patiently and lovingly guide us, as humans, back to an awareness of our essential selves, teaching us the art of living and being.